The Directorate for Human Resources of the Bogor Agricultural University (IPB) in collaboration with the Corruption Eradication Commission (KPK) organized technical guidance on filling out the State Administrator's Assets Report (LHKPN) form for officials within the IPB. 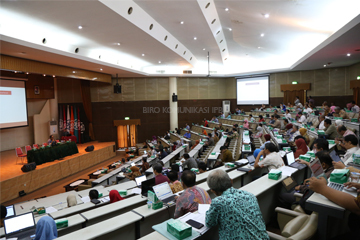 The technical guidance was held on Monday (1/14) at the Andi Hakim Nasoetion Auditorium, IPB Dramaga Campus, Bogor. The implementation of this technical guidance was based on Circular Letter Number: SE/05/M.PAN/04/2005 concerning LHKPN. It is stated in the circular letter that all officials in IPB must report their assets to the KPK through e-LHKPN. This regulation is supported by the Regulation of Minister of Research, Technology and Higher Education of the Republic of Indonesia Number 43 Year 2015 concerning Submission of State Administrator's Assets Report (LHKPN) in the Ministry of Research, Technology and Higher Education. This regulation applies to all higher education institutions including IPB. The officials are obliged to report their assets through LHKPN. "LHKPN is a state instrument to prevent any unexpected action and should be filled by all state officials including officials at IPB. IPB officials who are public officials must fill out and report every asset they have," said the Rector of IPB, Dr. Arif Satria. The Chancellor emphasized that this is a common duty of officials in the IPB. "IPB must create good integrity and avoid acts of corruption," said the Chancellor. On the same occasion, Director of Human Resources, IPB, Dr. Titik Sumarti said, this activity aimed to report the wealth of state officials in IPB. This technical guidance was carried out so that officials can fill the LHKPN properly and correctly. "We hope that officials in IPB can demonstrate accountability and openness to report their assets," she added. Until now, Titik added, the questions on who is obliged to fill in the LHKPN and when the state officials must report their wealth still often arise. Therefore, by conducting this activity, we got an explanation of what LHKPN is, who is required to fill in the form, what is filled in and what is actually expected by the government with this LHKPN. "Hopefully, all officials in IPB can report their wealth with high awareness. Officials in IPB must report their assets by being transparent, clean and maintaining integrity." Meanwhile, the Registration and Examination Specialist of the E-Technical Bimtek of the State Administrator's Assets Report (LHKPN), Jeji Azizi explained that the LHKPN is one of the obligations inherent in officials in IPB both directly and indirectly. LHKPN is a list of all state administrators' assets and their spouses and children who still become dependents as outlined in the LHKPN form set by the KPK. According to him, LHKPN reporting is a form of early prevention of acts of corruption, collusion and nepotism (KKN). "This LHKPN is a prevention, but there are still many things that are not on time. So maybe some institutions apply these sanctions. Since it is very preventative, thus, it requires every person to convey their assets transparently and on the basis of personal awareness for the position they hold," he said. According to Jeji, e-LHKPN is intended so that wealth reporting can be easier, cheaper and more useful. The officials simply download the LHKPN e-filling activation form. The form is filled in and then submitted to the institution's admin. After the admin processes the form, the State Administrators (PN) will get an e-filling activation by e-mail. By clicking on the link in the e-mail, the PN has been able to open and fill in the wealth report. He added, filling e-LHKPN is now easier. The officials only need to upload supporting documents in the form of proof of property ownership to the Financial Institution (Securities, Insurance, and Banking). Proof of ownership must contain three important things, namely the owner's name, ownership number, and the last balance when uploading the data. Documents that are not related to financial institution do not need to be uploaded, but the number must be submitted. (Awl/RA).